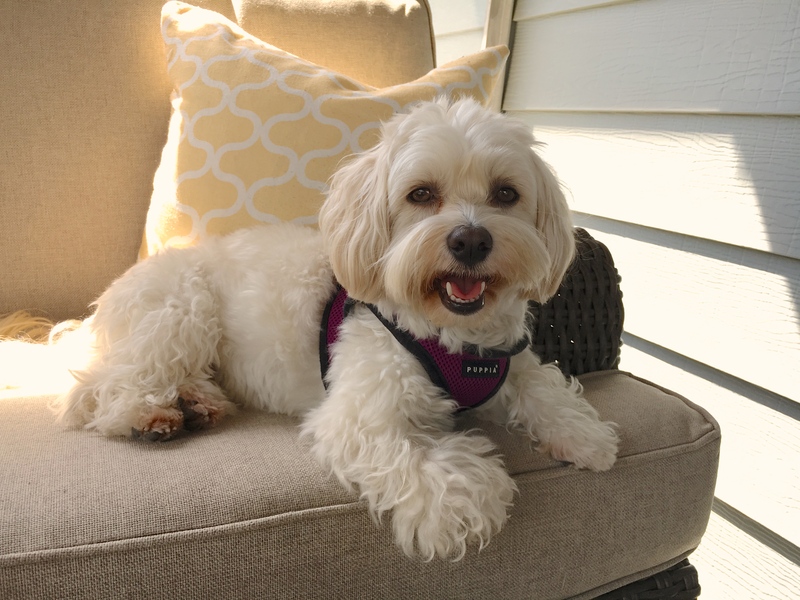 Gryffindor is a four-year-old Havanese who was rescued out of a touch situation as a puppy in Omaha. Her guardian has been spoiling him to make up for the rough start and now has a dog who is excited at the door, barking when guests arrive as well as marking in the home and office. The guardian set up this dog behavior training session so I could show her how to get him to stop marking and stop barking. It was pretty obvious Gryffindor was excited to see me as soon as the door opened. A few thoughts on the guardian’s approach to the dog’s door behavior. Anytime you pick a dog up you are rewarding it. Additionally, dogs don’t push or shove one another unless playing or mounting. I knew I was going to need to show the humans how to train the dog to behave at the door, but before we could get to that, I wanted to get more information about the dog and its day to day life. After chatting with his guardian, I learned that Gryffindor didn’t have any rules which is a pretty common factor for dogs who end up needing the help of a dog behaviorist. I suggested some rules and shared some dog behavior tips so that the humans will be able to enforce them in a way the dog understands and respects. I made a few other suggestions such as petting Gryffindor with a purpose and rewarding him any time he engaged in a desired action or behavior. I call the latter Passive training. The lack of rules had another consequence; it gave Gryffindor the impression he was a leader and needed to contribute to the group. He decided he was going to act as the guardian’s security guard; barking at people who knock, pass by the house or come to the store his guardian runs. Consistent enforcement of the rules and boundaries will help the dog start to see that the human has the situation under control Once that transition takes place, the dog barking will diminish and when it does occur, it will be easier for the guardian to disagree with him. In extreme cases, placing him on a leash and giving him a leash time out should stop the barking. After wrapping up ways to add rules and structure, I was ready to show the guardian how to train the dog to behave at the door. Many people fail to train a dog to behave how they want them to act in various situations. By breaking the activity down into small steps and helping the dog practice each step by itself until the dog knows what to do, it didn’t take long for Gryffindor to figure out what I wanted from him. When I had the guardian practice the same exercise, she was a little slow and soft in her movements which resulted in the dog going around her to get to the door. I suggested the guardians call or text one another when they are heading home so that they can play the part of a guest. By calling ahead, they can help the other person put things down and be ready to give the dog their exclusive attention. Its going to be hard for one of the guardians to avoid petting Gryffindor for no reason. Many people feel that correcting a dog or enforcing a boundary is “mean” and I think some of that was going on here. But if the guardian can pet him with a purpose and consistently enforce the new rules, it shouldn’t take long before Gryffindor starts seeing her as an authority figure. Once that is the case, he will listen to her quicker and need less corrections when he does break a rule or boundary. Once Gryffindor starts to identify as a follower (due to his human demonstrating that she is in the leadership position), it will seem inappropriate for him to mark things in the home. In the mean time, if she sees him walking back and forth past any object he likes to mark, she will need to monitor him closely and hiss loudly the instant he starts to raise his leg. If she can catch him with good timing and the appropriate intensity of her hiss, it should get her message across loud and clear. We finished the session by filming Gryffindor’s roadmap to success which you can watch by clicking the video below.